Plot holes: Nick only just makes the train from Manchester to London before it leaves, but the man following him is already on the train waiting for him. There was no way for the man to know Nick would get that exact train beforehand, and in fact he very nearly did miss it. The opening scene of the film shows that the recession has had far and wide reaching consequences across the economic board as the underworld boss Mr Thigo (Curtis '50' Jackson) decides to draw in every penny from all the outstanding loans he is currently owed. While Nick (Hassan) is the unfortunate customer who is going to be made an example of by Thigo to make sure everybody pays up promptly and without hassle  Barclays Banking this is not. Nick is given twenty-four hours to acquire the hundred grand he owes Thigo otherwise he and his mother (Brenda Blethyn) will be sleeping with the fishes. Cue a frantic race across London with his business partner and working-class friend Bing (Danny Dyer) in tow as they attempt various different activities while trying to raise the debt and stay alive. Hassan and Dyer play the typical characters you have seen them time and time again, and it is now becoming a little annoying as well as entirely predictable and boring. Nick is a former 'hardman' who was a resident at Her Majesty's service before taking the legal and law-abiding route so he could care for his family. While Bing is his right-hand man who is willing to do almost anything to help Nick obtain the £100,000 that he owes. Yet there is one gleaming performance in this stiff, wooden cast which is that of veteran British actress Brenda Blethyn who plays Nick's caring, soft, yet incredibly versatile mother who provides not only the biggest laugh of the film, but also the tensest scene as we uncover a secret she has kept buried under her blanket. 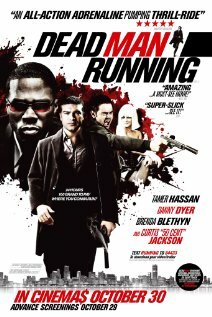 I was never expecting a brilliant film from Alex De Rakoff's British crime flick 'Dead Man Running', but I was expecting more considering the decent cast it contains. It fails to harbour the primarily British cast's potential and instead delivers a predictable narrative coupled with a terribly clichéd script. The biggest problem however is the fact that despite being evenly and well paced, the film has nothing which will keep an audience's attention for longer than five minutes.